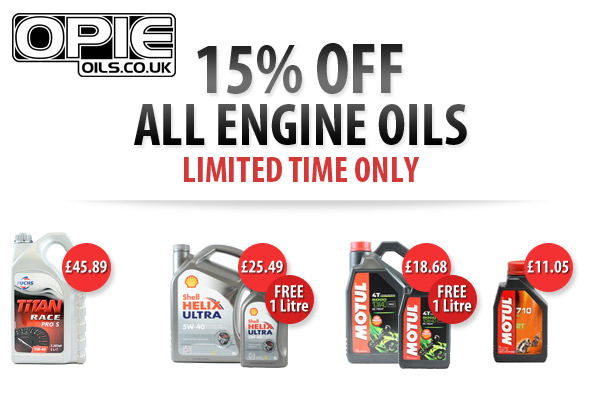 For a limited time only you can get an additional 15% Off All Engine Oils with voucher code ENGINEOIL on the NEW and IMPROVED Opie Oils web site. You can also use this discount on the recently released Motul Sport 5w-40, reducing the price to £41.63. This oil sits perfectly between the popular MOTUL 8100 X-Cess 5w-40 and MOTUL 300v 5w-40. It has specifically formulated by MOTUL for the UK market and to compete against other fully synthetic ester based 5w-40 engine oils that are used for fast road, track and competition use. For those shoppers who have American Express, you will be pleased to know that we now accept it on Opie Oils web site. We know accepting as many payment options as possible makes your shopping experience quicker and smoother, with the addition of American Express we now accept 6 major ways to pay through our website and 9 ways through PayPal. Don't be surprised if the Opie Oils website looks a little different, that's because it's NEW! We only released it late last year and haven't had a chance to tell you all about it but we will soon! Take a good look around and feel free to let us know your thoughts. That's it from us today, but if you have any questions or need any advice then we can help. You can call us Monday - Friday 8.30am to 5.30pm on 01209 202944, email us at sales@opieoils.co.uk or just ask us here.